Can you ever have too much maple? 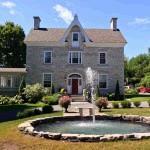 The owners of Lanark Highlands’ five-star, luxury bed and breakfast, Clyde Hall, certainly don’t think so. Situated on a working maple bush amidst the scenic rolling hills of Lanark Highlands, Clyde Hall is a popular destination for overnight visitors to Lanark County, but in particular for maple lovers. Named Ontario’s Top B&B by Cottage Life in 2015 and Huffington Post in 2016, Clyde Hall brings luxury and service to the next level in a circa 1840 architectural treasure. Formerly named the Caldwell Mansion, Clyde Hall first served for many years as a residence, then a convalescence home and seniors’ residence before finally being restored as a bed and breakfast. Tucked away on one of the Highlands’ many hills, and backing onto the winding Clyde River, Clyde Hall offers a stellar view overlooking the the third fairway at Timber Run Golf Course. Guests will enjoy spending the night in luxurious surroundings where everyone has a view to remember. At Clyde Hall, the maple theme is everywhere, beginning with a hearty maple-inspired breakfast, a culinary adventure that makes sense given that the husband and wife team who own the bed and breakfast are both chefs. After a restful night’s sleep, guests enjoy a breakfast of champions, with a menu that includes eggs benedict, frittatta, pancake and waffles topped with maple syrup produced from maple trees found right on the property, and maple smoked bacon (and more!). The maple theme doesn’t end there; in fall visitors can enjoy the colourful scenery as maple trees transition from green leaves to yellow, gold and bright orange, creating a stunning display of fall colours. Clyde Hall is also a destination on Lanark County’s Maple Trail, a mapped route leading visitors through the region with stops at maple-inspired destinations. The maple bush and surrounding forest at Clyde Hall is harvested through a partnership with a local producer, Providence Point, and can be purchased directly from Clyde Hall. Other partners include Timber Run Golf Course, and Temple’s Sugarbush.